Once the temperature dips below 50 degrees Fahrenheit, salads and other light and healthy meals become tremendously less appetizing. Many fruits and vegetables are no longer fresh or as affordable since the bounty of summer produce has passed. The cold weather stokes our cravings for comfort foods and it can be easy to turn away from healthy whole foods and plant-based meals to indulge in heavier and richer foods. If you’re like me, my sweet tooth flares in the winter time. 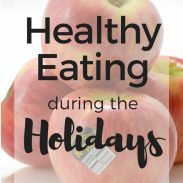 Perhaps this is caused by the increased availability of candy and baked goods around the holidays, but I also believe that the colder weather spurs sugar cravings, as my body craves comforting food and carbohydrates. Even for those of us who prefer eating a plant-based diet or a Paleo-ish diet, cold weather tempts us to eat the foods that don’t always leave us feeling our healthiest or best. This doesn’t mean you have to succumb to your comfort food cravings, but it also does not mean that you should starve and deprive yourself! 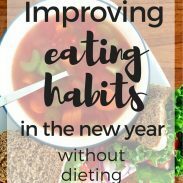 With these practical tips for eating healthy when the weather gets cold, you can maintain a nutritious diet full of fresh whole foods that will nourish you, body and soul. Look around your produce department during winter. The zucchinis are diminutive and depressing, the berries are overpriced, and there’s not a peach in sight. However, there are several nutritious seasonal options, which will provide you with the exact nutrients you need during the colder months: immunity-boosting vitamins to ward off the common cold and flu and mood-boosting minerals to beat seasonal affective disorder. Winter squashes (including acorn, butternut, spaghetti, pumpkin, and kabocha), Brussel sprouts, apples, pears, cauliflower, potatoes, carrots, cabbage, and beets are some of the many vegetables that harvest in November, December, and January. Many of these fruits and vegetables can and/or should be cooked for optimal flavor and digestion. Roasted or steamed vegetables and baked fruits provide that warmth that your body desires during winter and these healthy foods provide the same mental benefits as comfort foods while nourishing your body. Try this roasted butternut squash and sweet potato side dish for a quick and easy way to enjoy some of winter’s best produce! Our bodies crave warm food during the fall and winter months. Instead of eating your normal cold salad, top your favorite greens (I can’t get enough of arugula right now) with roasted vegetables and potatoes, crispy chickpeas, toasted nuts, or warm chicken or beef. The warmth of the food will increase your satiety and provide the same feeling of comfort food while giving your body the nutrients it needs. Many autumn and winter vegetables, such as cauliflower, winter squash, cabbage, Brussel sprouts, and parsnips, are also easier to digest when cooked, which is another reason to cook your toppings and transform your salad into a hearty winter meal. Need ideas for a hearty winter salad? Try this roasted root vegetable salad or this warm acorn squash and wild rice salad for nutritious comfort food. Chili does not always sound like the healthiest food, but it’s easy to adapt to fit a healthy diet while still being a comfort food. I love both Paleo chilis and vegetarian chilis; they’re flavorful, warming, and satisfying on their own, or they can be enjoyed on top of rice or whole grain pasta. While some cream-based soups can be loaded with fat and calories, healthy soup recipes abound and are easy to make. The volume of soup makes it incredibly satiating and you can pack a lot of vegetables into a single serving of soup. I love this Paleo beef and butternut chili from Paleo Leap and this slow cooker curried butternut chili from Hummusapien. We associate certain spices with fall and winter: cinnamon, nutmeg, and paprika, for instance. Many spices add depth and warmth to food and provide that comfort food taste without adding on extra calories or fat. Think of how spicy foods heat you up from the inside out! Cumin, cinnamon, turmeric, chili powder, paprika, nutmeg, ginger, and harissa all add a complexity of flavor to healthy meals that will keep you toasty even on a cold November day. Spicy foods offer winter specific health benefits as well: if you get sinus infections or colds in winter, spicy foods may help clear out your sinuses or relieve a stuffy nose (source). Add some spice to your diet with this vegan and gluten free curried beans and green brown rice bowl. Don’t mistake me: I love mac & cheese, mashed potatoes, baked pastas, and pizza. However, for the sake of my healthy, my sensitive stomach, and my running goals, I don’t always indulge in the heavy versions of my comfort foods. Instead of traditional mac and cheese, I make a cheese sauce using chicken stock, squash puree, and a sharp and flavorful cheese for a creamy texture and cheesy flavor but less calories and fat (not to mention sneaky vegetables!). I lightened up mashed potatoes by using red potatoes (they’re less starchy) and just a tiny bit of butter and a splash of cream or coconut milk . 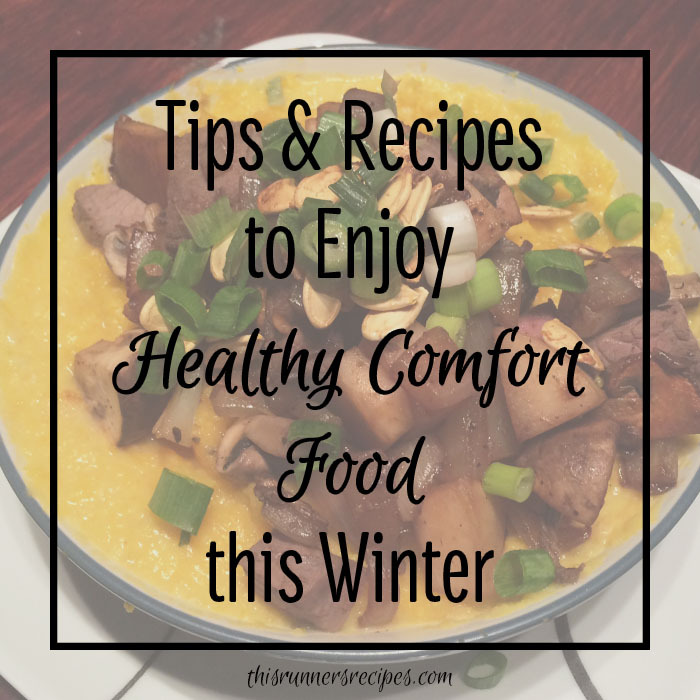 With a bit of creativity, you can easily enjoy your favorite comfort foods regularly throughout the winter – no more deprivation! Lighten up your favorite comfort foods with recipes such as this cheesy acorn squash pasta and this vegetarian autumn harvest whole wheat pizza! I will never be one to tell you to give up dessert. That said, dessert doesn’t always have to be a piece of rich chocolate cake or a decadent brownie; there are several delicious desserts you can make using seasonal fruits and vegetables. Since the fresh produce has so much flavor, you can decrease the amount of sugar and butter used as well. From crumbles and pies to brownies and cookies, the options are endless as you can use pumpkin, winter squash, apples, pears, oranges, and pomegranates for a nutritious twist on your favorite sweet treat. Have your cake and eat it too! Enjoy healthy desserts such as this gluten free apple pear crumble and this butternut squash pie with oat crust. What are your favorite comfort foods? Do you have any healthy versions of them? Do you tend to alter your eating habits as the weather changes? 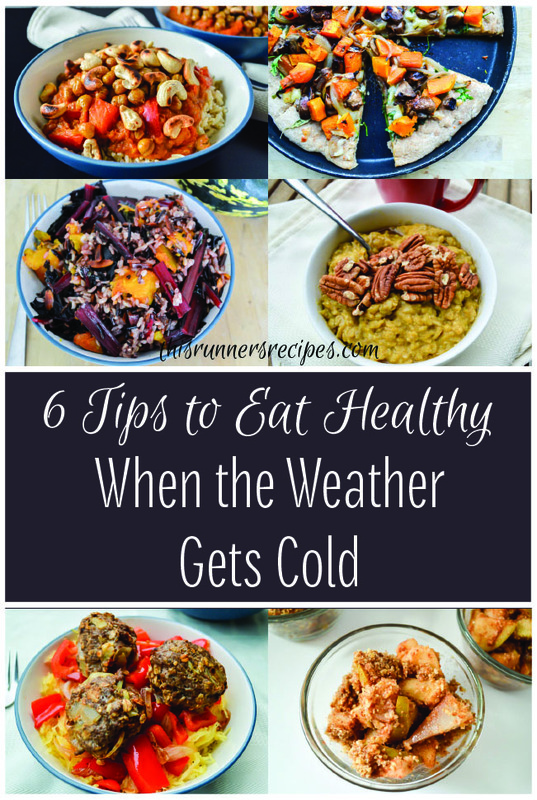 What are your tips for eating healthy when the weather gets cold? I love warm salads loading with roasted vegetables and especially in the fall/winter, roasted butternut squash! I don’t really like soup but I do notice that in the colder weather, I want more warm bowls of food rather than cold salads and smoothies. Roasted butternut squash is the best and so delicious on winter salads! I go squash crazy! But I also love me some soup–I just always goes for broth based ones, or purees. And stirfries and other dishes that are heavy on the veggies are a great way to go as well! Oooh, veggie stirfries are another great winter meal! for some reason I REALLY need to plan ahead a lot more in the winter than summer. You must be able to read my mind, Laura because I was just thinking about this. My appetite and cravings definitely change with the coming of winter including an annoying sweet tooth! I love salads but you’re right, a cold salad just isn’t as appealing when its cooler out. I LOVE your idea of adding warm squash, veggies or potatoes so I will be trying this. I love to make my own vinaigrette and they would be great on a warm salad. I like to make healthy soups and chili during the colder months and they are an easy lunch. Thanks for the great tips! Thank you so much, Angie! Great minds think alike. 🙂 Healthy soups and chili are favorite lunches of mine as well! I have the hardest time drinking smoothies when it gets cold which is too bad because it’s a guaranteed way that I can get greens into my body. I am more intentional about making soups and throwing bags of frozen veggies in the broth. Smoothies are so hard when it’s cold outside because they can make us feel cold on the inside – bbrrrr! Frozen veggies in broth is a great go-to soup! loveee warm salads. People think it’s so weird, but adding warm veggies and cubed squash is SO GOOD. Love these tips! Only people who’ve never tried it would think warm veggies on salad is weird! And thank you! I love these tips! I struggle a lot with healthy eating when it’s cold- all I want is warm, heavy foods. Not exactly the most healthy! My favorite chili is packed of veggies and beans, and uses turkey instead of beef. So delicious and I make that a lot. I’ll have to use your tips as well! Thank you! Your chili sounds delicious – I love turkey in chili! Thank you, Hanna! Warm foods are especially super good after chilly winter runs. 🙂 Meal prep is hard, which is why roasting everything is my favorite method for winter cooking – everything in the oven and just relax until it’s done! I make an amazing 4 cheese mac and cheese using a recipe from Cooking Light–it’s an oldie but a goodie! Guilt free, really. And I love soups! Oooh, that mac and cheese sounds so good! Love these tips! I’m eating pretty paleo right now but I’m definitely craving some carbs with this cold weather. My goal is to make lots of healthy soups to get me through the winter. I loved your warm salad idea too! Healthy soups are the best in winter! You can pack them so full of healthy vegetables! Warm salads are definitely my thing! I need to start making more soups though. Warm salads are so good! Your hashes always look like tasty winter meals as well! Welcome to This Runner’s Recipes! Hi, I'm Laura! I'm a distance runner, RRCA certified running coach, and outdoor enthusiast living in Northwest Indiana. Whether you want to run your first race or qualify for Boston, I'm here to help you achieve your personal best with training tips, coaching services, and nutritious recipes to fuel your running. © Laura Norris and This Runner’s Recipes, 2018. Unauthorized use and/or duplication of this material without express and written permission from this site’s author and/or owner is strictly prohibited. 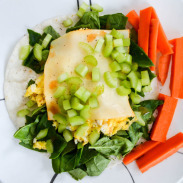 Excerpts and links may be used, provided that full and clear credit is given to This Runner’s Recipes with appropriate and specific direction to the original content.